Lawrence MacIsaac recalls stories of his great grandfather using the property to teach his sons how to snare rabbits, while his great grandmother commonly used the ‘laundry stone’ at the bottom of a small waterfall to wash clothing. With the extremely steep sides of the gorge it was difficult to do anything with the land, including the harvesting of trees, so it was left to grow wild. Before there was a site, there was an idea of a cabin in nature. 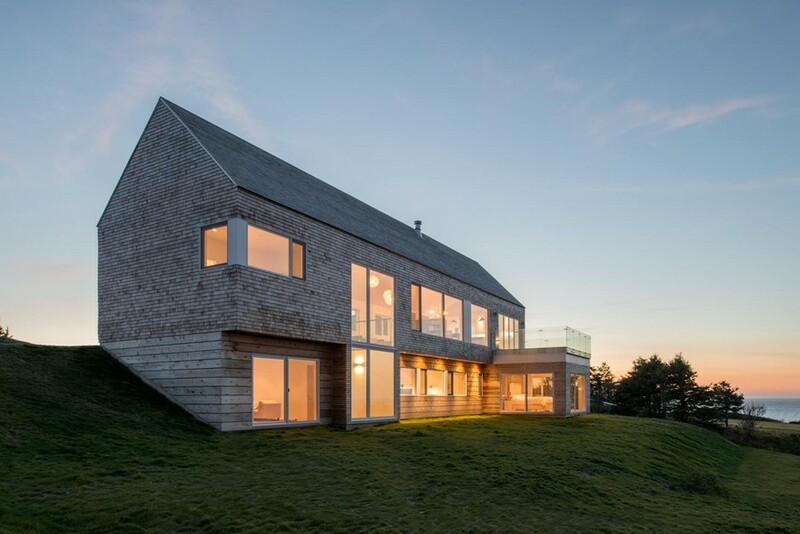 As the Northeastern seaboard urbanized, the client longed for an escape to a wilder land. Arriving in Cape Breton, they found a culture and remoteness no longer common to the United States. 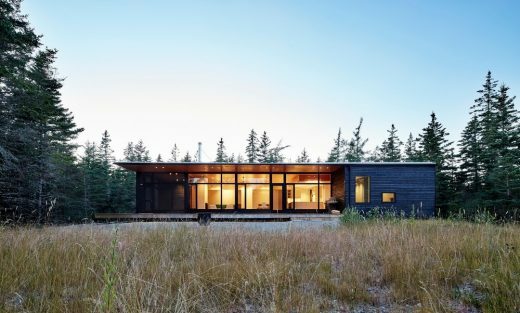 To leverage the surrounding landscape, the home would put the outdoor environment on display and encourage the occupants to get out and explore the terrain. 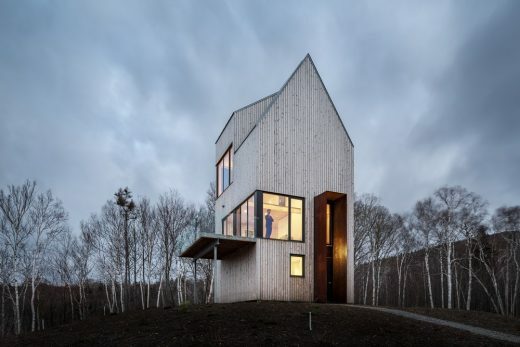 On a trip to Nova Scotia, Kevin Briody and Design Base 8 became fascinated with the built typologies of the region. 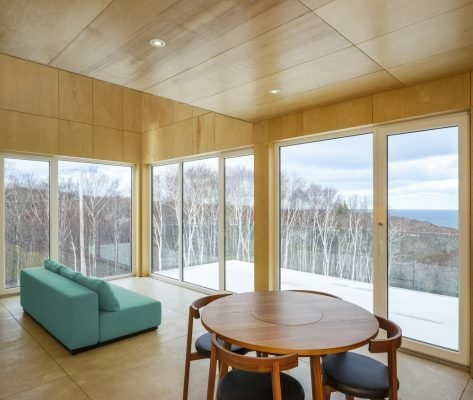 After working closely with the client through numerous design iterations, Design Base 8, a design collective based in NYC, reached out to Omar Gandhi Architect of Halifax to collaborate on the final design, detailing, and construction process. 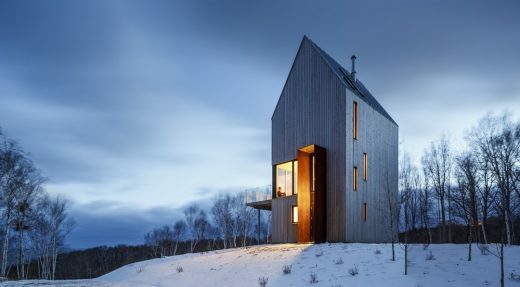 The cabin at Rabbit Snare Gorge is the result. It is the first of three small creature-like structures hidden in the mysterious landscape. 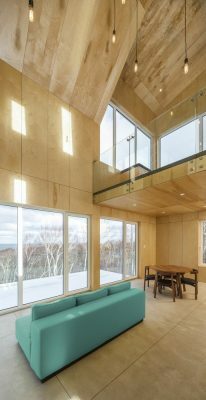 The cabin is the primary dwelling on a 46 acre parcel of land found on the rugged wooded coastline of rural Cape Breton. 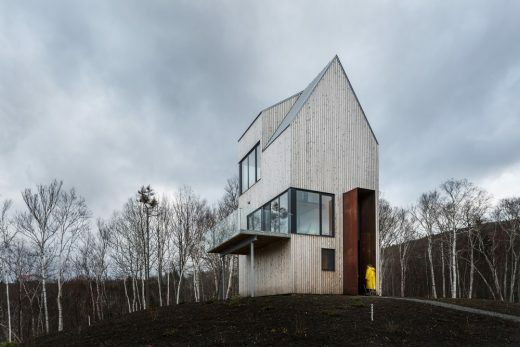 The cabin is a gently adapted gabled tower which allows it to reach above the forest canopy with two major viewing platforms, one oriented directly towards the ocean and the other along the length of the convergent brook valley. 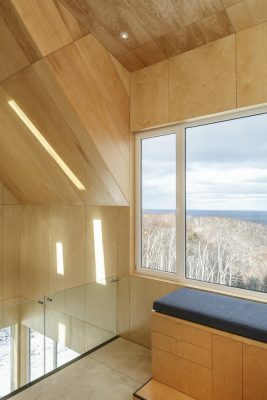 The landscape of Rabbit Snare Gorge is defined by the steep slopes of the Cape Breton Highlands, Acadian forest, deep gorges cut by a babbling brook, and the rocky cliffs of the Northumberland Strait. 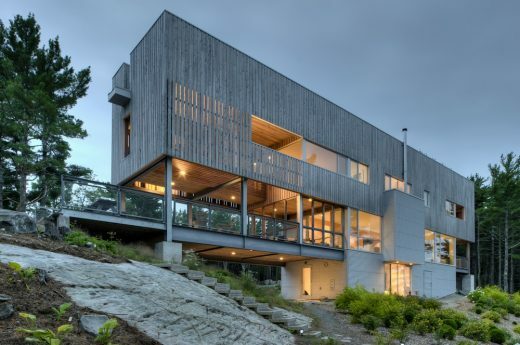 The elevated position of the site allows for a long, wide view of the entire property including the head of the gorge leading towards the ocean. 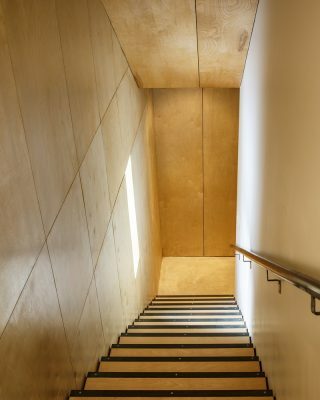 The procession from this rough landscape into the cabin begins with the entry and bedrooms on the ground floor, a double height kitchen and dining room on the second floor, and lastly the living space on the third floor with the final lookout view of the entire property. 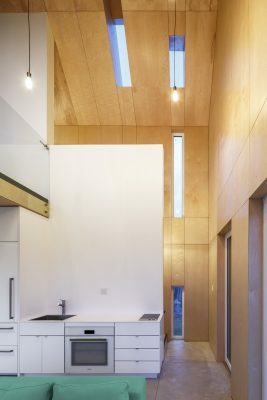 The structure is linked to the local vernacular by a number of formal elements. 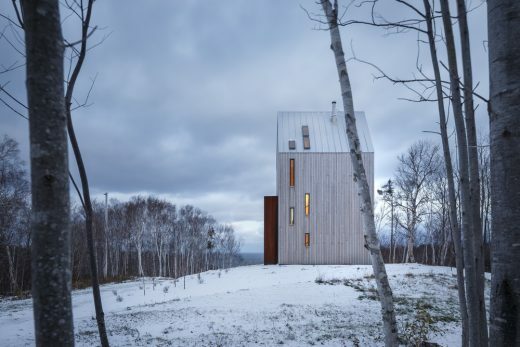 The archetypal gable and shed forms of the cabin are combined to open views and follow the path of the sun, emphasize the major interior spaces, and accentuate the verticality of the tower, while efficiently shedding snow and rain. 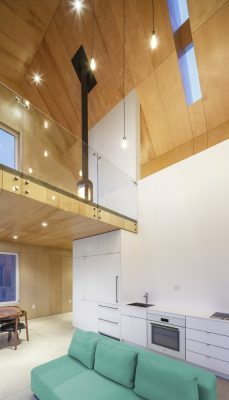 Traditional, local wood board cladding is used on the exterior of the cabin. 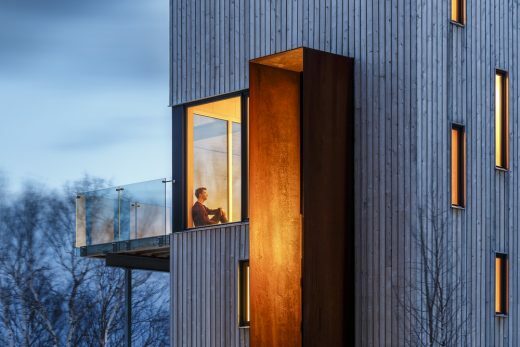 The cabin’s steel entry hoop takes its shape from the entry windbreaks unique to the Cape Breton and Newfoundland coastal communities. The client, an avid outdoorsman and hobby arborist, has a sincere respect for the natural landscape. 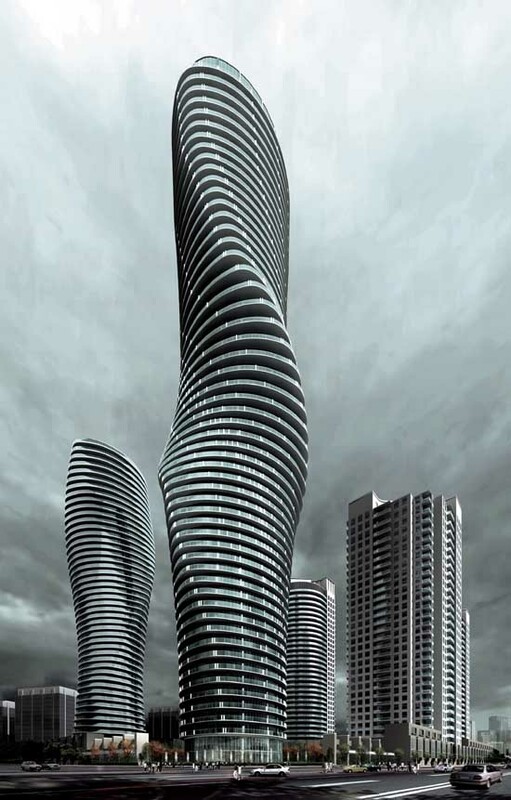 Therefore, sensitivity to site and ecological preservation was an early and major design parameter. 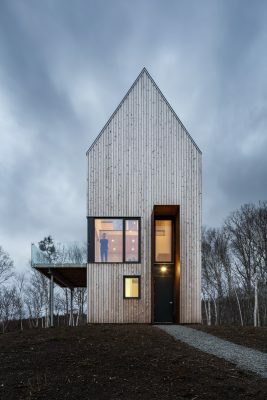 The tower typology of the cabin offers elevated views and ample programming within a minimal footprint. 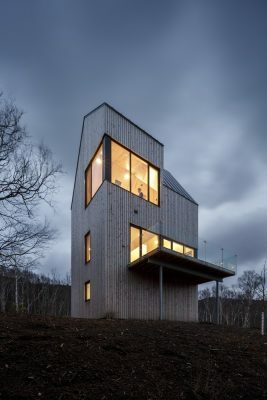 However, the exposure of the sloped site means it endures the full brunt of heavy Atlantic rainstorms, winter Nor’easters, corrosive salt-spray from crashing swell, and strong suetes winds—local south-easterlies which accelerate down the Highland escarpment to reach speeds of over 200km/h. The strong, local suetes demand a robust structural system to withstand major lateral and uplift loads. 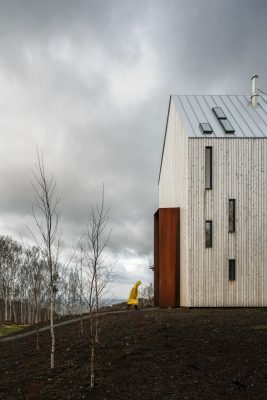 The tall cabin combats these high winds through redundant sheathing—every solid plane, including the interior partition wall, contribute as shear walls, diaphragms and stacked compression rings. 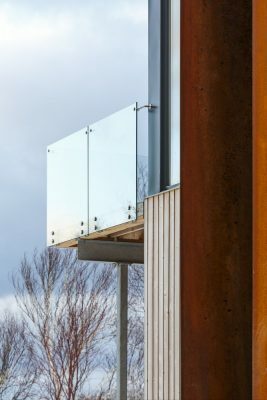 The windbreak, constructed out of welded weathering steel, is then hung from the framing.